Earlier today, HRC and other civil rights leaders held a press conference to discuss a potential Trump executive order that could extend a broad license to discriminate against LGBTQ people. 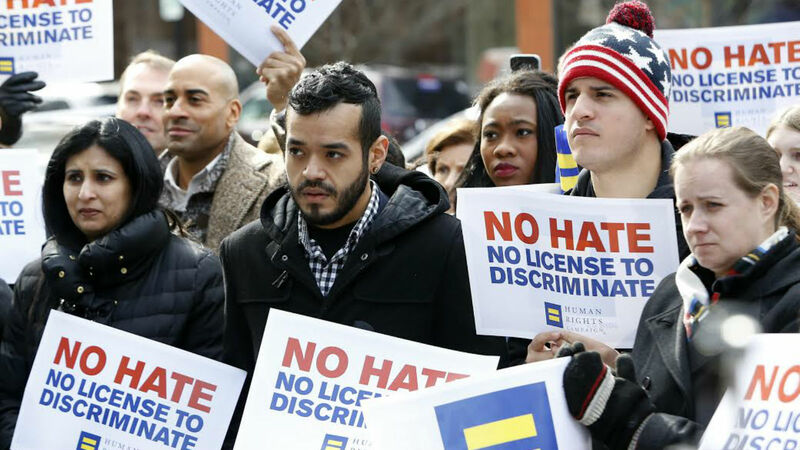 HRC and a broad coalition of other advocates addressed persisting rumors and other Trump actions that directly impact LGBTQ women, Muslims, immigrants and other communities he has already specifically targeted. Speakers included: Chad Griffin, Human Rights Campaign; Wade Henderson, Leadership Conference on Civil Rights; Mara Keisling, National Center for Transgender Equality; Greisa Martinez, United We Dream; Rea Carey, National LGBTQ Task Force; Corey Saylor, Council on American-Islamic Relations (CAIR); Winnie Stachelberg, Center for American Progress; Donna Crane, NARAL Pro-Choice America; Aisha Moodie-Mills, Victory Fund; Michael Lieberman, Anti-Defamation League; Eric Rodriguez, National Council of La Raza; Mary Kay Henry, Service Employees International Union (SEIU); María Teresa Kumar, Voto Latino; Fatima Goss Graves, National Women’s Law Center; Deirdre Schifeling, Planned Parenthood Action Fund; Ian Thompson, ACLU; Raffi Freedman-Gurspan; White House LGBT Liaison during Obama Administration; Urooj Arshad, Muslim Alliance for Gender and Sexual Diversity and NQAPIA; other leaders. HRC needs your help to fight back. This move could allow a wide range of individuals and organizations — perhaps even for-profit companies — to legally discriminate against LGBTQ people. We can’t sit on the sidelines. We must act.